HomeNet is a new way of thinking about home automation and "Smart Houses": DIY, Open, Free, and Collaborative. 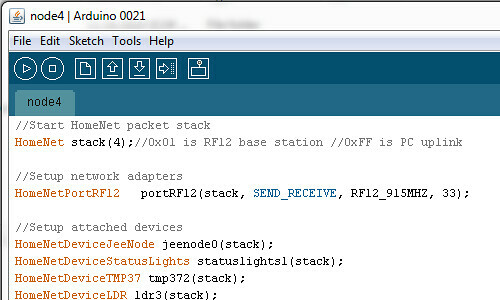 It's ideas that can be adapted to run on a variety of hardware platforms from simple Arduino microcontrollers to PCs. HomeNet's goal is to unite all of your home's systems under one interface, that you can access from anywhere, from your pc, tablet or cell phone. Based on Open Source Arduino hardware, it's easy to integrate your existing devices or build your custom device. The dream of HomeNet is to one day link all of your home systems like: security system, smoke detectors, doorbell, home automation, lights, light switches, thermostats and more so that the devices become "smart" and can interact with each other. Manually schedule devices to turn on and off, on a programmable schedule. Check on your home on the go. 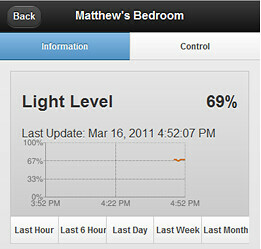 View and control your home from your cell phone. 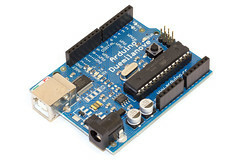 For some, programming an Arduino can be intimidating. HomeNet.me makes it easy by generating the code you need automatically. Already an Arduino user? HomeNet.me also offers code templates you can customize to add custom functionality. You can build an even bigger, and better HomeNet using JeeNodes from JeeLabs. They are have an integrated wireless transmitter so you can have nodes all over your house. HomeNet.me makes it easy by managing your nodes and keeping track of the code required. The project is currently in a pre Alpha state. New features are being added at a rapid pace. I am working on getting a public demo up. Let me know if you want to see it sooner. The HomeNet.me project could greatly use the skills of some talented people. There are many area's where you can contribute- improve the Arduino Device drivers (c++), improve the Desktop App (Java), add new features to the web backend (PHP/Zend Framework) or enhance the front end (jQuery/jQueryUI). All of the HomeNet.me source code is avaliable on Google Code. This is currently the Master Project of Matthew Doll, a graduate student at the University of South Florida. I'm am very interested in continuing work on this project after I graduate in the spring. I am currently looking for interest into creating a kickstarter.com campaign to launch a company around this site. Interested in helping out? Let me know! Another possibility is getting some grant money. If you know of a grant I should pursue, I want to know.